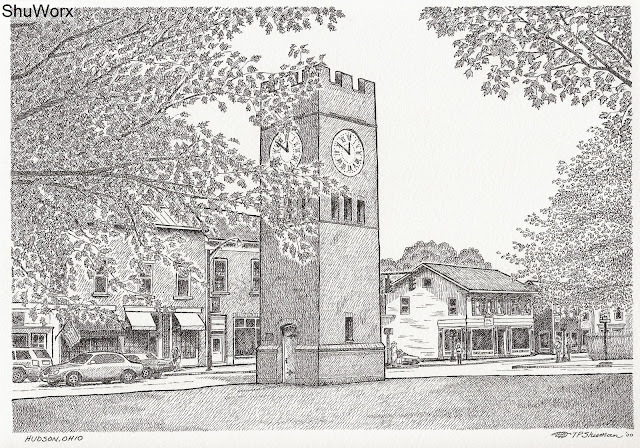 Another drawing from Hudson, Ohio. 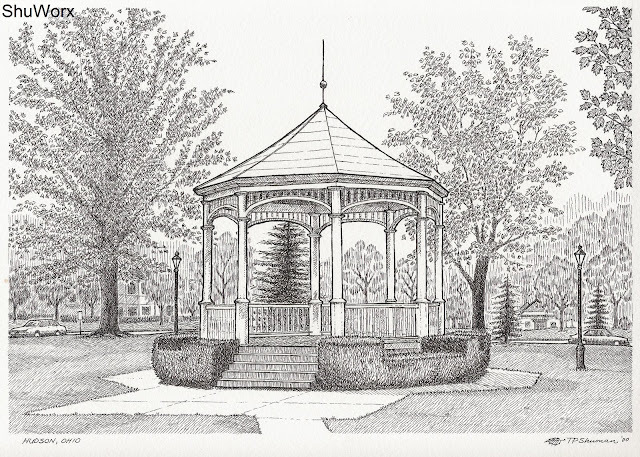 This is the town's bandstand where weekly concerts are held on Sunday nights in the summer. This one has the names, "Tim", "Sandee", "Luke", and "Tyler" hidden in it. Maybe you can find them by clicking on this picture and looking around. Heavy stock paper, rapidograph pen, the usual thing. Lots of pen strokes. Discover God in the world around you. "Our world is saturated with grace, and the lurking presence of God is revealed not only in spirit but in matter – in a deer leaping across a meadow, in the flight of an eagle, in fire and water, in a rainbow after a summer storm, in a gentle doe streaking through a forest, in Beethoven’s Ninth Symphony, in a child licking a chocolate ice cream cone, in a woman with windblown hair. God intended for us to discover His loving presence in the world around us." Do you know the name of the Artist who made this scene? I simply took a picture in HIS presence. Look for this picture to be turned into a "Shuwork" in the near future. I drew this picture a number of years ago. This town is just north of my hometown of Stow, Ohio. I have always liked the views in this town. This clock tower is a well known landmark. I enjoyed drawing this picture, however, that's a lot of leaves to draw, ain't it? Pen: Rapidograph technical pen, 0.25 and 0.35, naturally. Three best tools for pen and ink work - .35, .25 Rapidograph, .38 Uni-ball. Close up of the .25 rapidograph. There is a lot of relaxation in the point of that pen. These pens can be expensive in the store, but you can find great deals of ebay. I did. 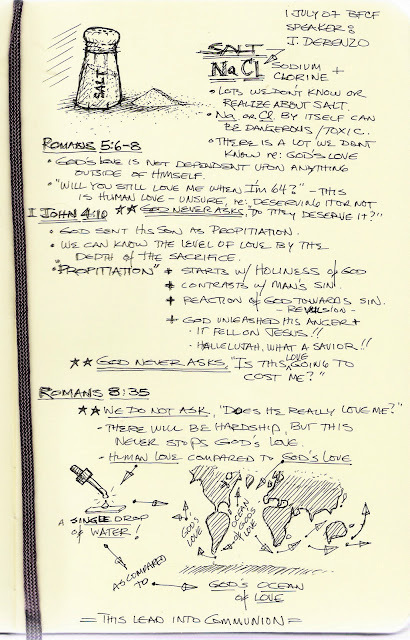 Here are the sermon notes from this morning at Black Forest Christian Fellowship. Mr. Jerry DeRenzo, a middle school teacher at BFA, spoke on God's love. Jerry's messages are always full of great word pictures that are easy to draw into notes. Thanks Jerry for the encouragement today. - Paper: Moleskine blank journal, 5.25x8.25, 13x21cm, what a great book! The paper is heavy and smooth, and takes gel ink perfectly.